Rye is a littermate to Brandy one of our other available dogs. Both are very young girls that only raced a few races and never had much of racing career. 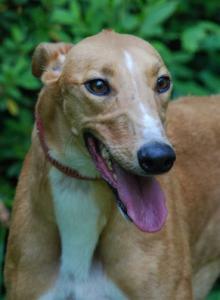 Rye is a playful, fun girl like you would expect from a greyhound that is barely more than a pup. She bounces happily to see you and is very friendly and doesn't seem to have any shyness whatsoever. Rye is a little excitable when you first put her leash on but calms down and walks nicely after a minute or two. She is a small girl with the sweetest face and personality. She passed her cat and small dog test so should be fine living with either and was fostered with a small dog. Rye's date of birth is 6/13/09.